The simple solution to the burden of constant tax increases is for Australian governments to spend less. Among the many theories of the development and origins of government, there is one theory in particular worth considering in the current economic and political climate. In his Power and Prosperity book, American economist Mancur Olson depicted different styles of government. Olson described anarchy as a system of roving bandits where, as the descriptor suggests, bandits roamed about stealing and destroying. Olson then described tyranny as a system of stationary bandits, where the smarter bandits worked out it was better for them to protect citizens from (other) roving bandits, thus allowing some degree of certainty and prosperity. Stationary bandits provided what looked like basic governmental functions, protecting citizens from roving bandits and encouraging some degree of economic activity. However, in return, the stationary bandits charged a protection fee. Notably in both cases, citizens were ‘governed’ by bandits and they collected what generally could be considered as taxes. Which brings us to the Australian fake tax wars of 2018 where, at least at the Commonwealth Government level, both major political groupings are discussing where to increase and decrease tax, but all within an envelope of increased total taxation; oblivious to the words of Milton Friedman, who said that “if a tax cut increases government revenues, you haven’t cut taxes enough”. In addition to taxation being the only form of revenue legally permitted to be collected through physical force, the interaction of taxation and inflation offers government finances a magical privilege. Through inflation, governments can generate increased tax revenues without increasing tax rates. This is not a fault of the system. This is a design feature. Wage price inflation generates additional income tax, and payroll tax. Consumer price inflation generates additional goods and services tax, and fringe benefits tax. Asset price inflation generates additional land tax, capital gains tax, and stamp duty. And even when taxes do not auto-inflate, governments index such taxes. There are not too many entities that can generate additional revenue from just standing still. Yet despite the inflation privileges of taxation, plenty of people believe taxes are not rising enough. Since the election of the first Kevin Rudd Government in 2007, and progressively following the onset of the global financial crisis in 2008, there have been repeated calls for increasing and broadening Commonwealth Government taxes so as to “repair the tax base”. One might have thought Government fiscal ‘prudence’ is better reflected through caution in spending rather than aggression in taxation, but we live in interesting times. Unfortunately, the views of Dr Emerson are not uncommon. The view of many—too many—is that the means to fortify government finances requires, unfortunately but necessarily, damaging the finances of households and businesses. For the greater good, of course. To suggest Government tax bases were somehow damaged post-2007-08, necessitating repair, is grounded in rhetoric rather than reality. What actually occurred is that government tax revenues failed to keep up with insatiable government spending levels. More specifically, tax revenues have failed to meet the cost of expanding, expensive and often ineffective government programs while attempting to maintain a facade of fiscal responsibility. 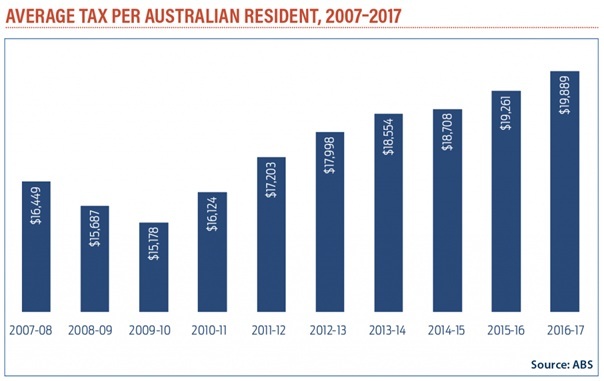 According to Australian Bureau of Statistics (ABS) data, total taxation receipts across the three levels of Australian government increased 40 per cent from $349 billion in 2007-08 to $489 billion in 2016-17. 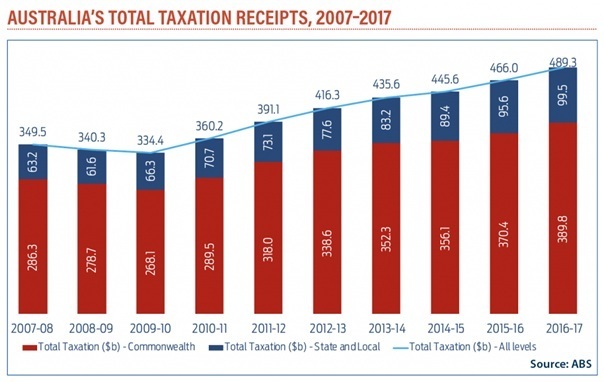 For the Commonwealth Government only, total taxation receipts increased from $286 billion in 2007-08 to $390 billion in 2016-17. That’s a 36 per cent total increase, or a cumulative average annual increase of 3.1 per cent. While the quantum and rate of growth in taxation receipts is high, it should also be considered in the context of population with the total number of Australian residents increasing by 3.4 million persons over the same period. Yet over the same 10-year period, the average amount of taxation collected by all levels of government per resident (man, woman and child) increased from $16,449 to $19,888 per annum, or 21 per cent. The average two-adult, two-child household is paying an additional (roughly) $14,000 per annum in tax since 2007-08. Not to mention more in other Government fees. But are households $14,000 better off? The view that Government fiscal prudence requires increased taxation seems also to reflect poor learnings from earlier Australian government debt and deficit predicaments. Whereas once the lesson of government deficit crises was to constrain government spending, it appears current thinking is that taxes need to be increased so as to never interfere with Government spending. When it comes to spending, Australian governments are addicted, irrespective of their political flavour. Our political masters have a cognitive bias to action which—paraphrasing HL Mencken— translates that for every complex problem, there is a government program that is grand, expensive, yet ineffective. Seldom does a government voluntarily propose a withdrawal of funding or reduction of regulation in response to a public policy challenge. And all too frequently, governments propose interventions when there is no public policy challenge or otherwise grounds for government involvement. Consider, for example, the nationalisation of metropolitan broadband internet infrastructure. The only visible difference in the spending patterns of different political parties seems to be the speed of expenditure growth. When it comes to trajectory, spending is always increasing because Australian governments always seem to find new and better ways to spend other people’s money. Based again on ABS data, in the 10 years to 2016-17, total spending across the three levels of Australian government rose from $387 billion to $624 billion; an increase of $238 billion or 61 per cent. The Commonwealth Government, never satisfied in coming second in any spending race, increased its spending by $172 billion or 62 per cent over the same period. This is a cumulative average annual increase of 4.9 per cent; faster than inflation, and faster than average wage growth. More concerning is that Government spending grew faster than GDP over the same period; demonstrating the government sector grew faster than, and at the expense of, the non-government sector. 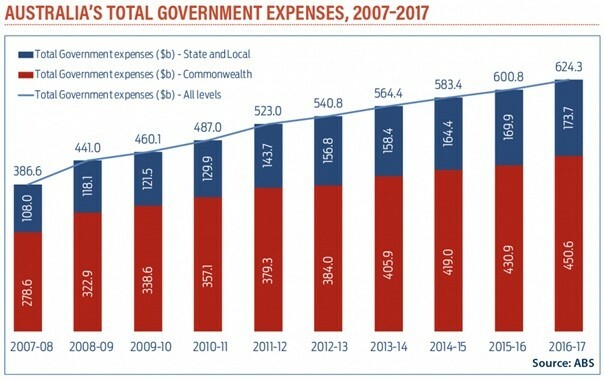 As a proportion of GDP, total Government expenses increased from 33 per cent to 36 per cent, and Commonwealth Government expenses increased 24 per cent to 26 per cent. Yet despite this strong increase in government spending, it is argued the actual problem for Australian governments’ finances is tax-base erosion. Where all this additional spending has gone is not entirely clear. 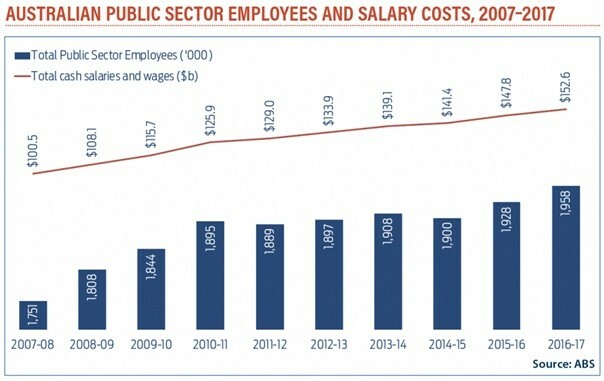 But according to the ABS data, one area that has done quite well has been the public service, whose ranks have increased by 200,000 nationally, and whose salary costs have increased by some $50 billion over the 10 years. Interestingly and concerningly, the total number of Australian public sector employees—excluding permanent defence force members, overseas embassy and consulate employees, and employees on workers’ compensation—is greater than the population of Tasmania, and also greater than the population of South Australia. In his 1964 A Time for Choosing speech, Ronald Reagan said, “No nation in history has ever survived a tax burden that reached a third of its national income”. The only reason tax authorities in Australia don’t collect 36 per cent of national income is because of miscellaneous pseudo taxes, such as fines, levies and licences, and because in aggregate, Australian governments run budget deficits. As noted earlier, over the 10 years to 2016-17, cumulative average annual increase in total government spending was 4.9 per cent, whereas the cumulative average annual increase in taxation revenue was 3.1 per cent. This gap can be explained through other government fees and, significantly, through debt. This contributes to explaining why, according to OECD analysis, since 2012 the only advanced countries that contracted more debt than Australia (Commonwealth and State governments) were Spain (one of the PIIGS), Latvia (a former Soviet satellite state), and Slovenia (a former Yugoslavian province). Nock’s words, some 80 years ago, need to be considered in the context of governments of his day, which were much smaller in size and much narrower in focus. Basically, the parasite did what parasites do. And our own very special parasite also did what it does because our political system incentivises and rewards bad behaviour. Mix in poor civics and economics education with social media and sprinkle a touch of virtue-signalling dust, and you get a system of asymmetric budgetary costs and benefits. Increased spending plus increased taxing has a higher political payback than decreased spending plus decreased taxing. These asymmetric returns are due, not insignificantly, to the distribution of taxpayers and Government spending beneficiaries. 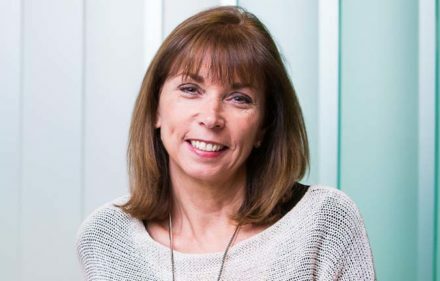 In a recently published analysis, The Centre for Independent Studies (CIS) showed the bottom 60 per cent of households received more in benefits than they paid in taxes, including GST and excise taxes. And 60 per cent of households translates into more than 60 per cent of voters. As the CIS noted, Australia has a cohort of citizens who “vote for a living”, causing significant challenges for public and fiscal policy. Perhaps it is time for a new system. People respond to structures and incentives, so perhaps that system should be based on the Code of Hammurabi. Hammurabi was a Babylonian king who reigned from circa 1810 BC to 1750 BC. He implemented a legal code based on the principle of retaliation, an eye-for-an-eye or lex talionis. Hammurabi’s Code ensured many things, but certainly it ensured skin in the game. People advocating for government action should not be insulated from the consequences of that action. But our system of government relies on a clerisy of advisors and bureaucrats who provide frank and fearless advice. That is, advice disconnected from the consequences of taking that advice. This is somehow considered virtuous and desirable. Applying Hammurabi’s Code to construction would mean that if a builder built a house poorly that resulted in the death of the owner, then the builder would be put to death. Similarly, if the building owner’s son was killed from bad construction then the builder’s son would be put to death. Using these principles, it should not be permissible for people to advocate for taxes on other people, or that disproportionately affect other people. For example, in increasing taxation on private superannuants when the advocate is a recipient of a public superannuation should not be permissible. Similarly, government spending should not be funded through debt, a process by which someone else at a later time pays for the spending. Australian governments’ fiscal trajectories are heading in an unsustainable direction. The solution to budget deficits and government debt is not more taxation. It is reduced government spending. Dimitri Burshtein is an Australian financial services executive and company director. This article was originally published by the Institute of Public Affairs: ipa.org.au. 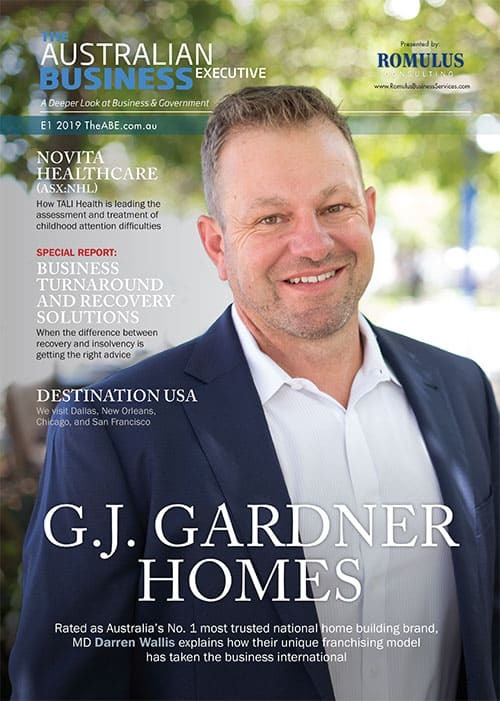 Next storyThe CEO Journey: Is it time to capture your legacy?